For a two-player or three-player game, follow the same setup steps but see "Setup Configurations" for changes. 1 Unfold the Islands board and place it next to the Foundations. 2 Place all the cards* in their respective locations around the Islands Board, forming stacks of four identical cards. Match the card cost and the cost indicated on the location. 3 Place the Round tracker on space "1" of the round track. Take a Hero inventory and place it in front of him. Take the five Resource markers of his color and place one on each space "0" of his Hero Inventory. Take the Hero pawn of his color and place it on the matching starting portal. Take a Light Die and a Dark Die and place both in their designated spaces on his Hero Inventory. 5 The youngest player becomes the first player and takes the First Player token (which he will keep until the end of the game). 7 Remove the Temple from its sleeve and place it on top of the Foundations. Place the sleeve aside for the rest of the game. Perform step 1: All Players Receive Divine Blessings" twice in a row at the start of each round. After their first game, players can add variety by changing which Heroic Feat cards appear in the game. When setting up the game, simply replace one to nine sets of Heroic Feat card with the corresponding alternate set available. To add more challenge, you may randomly select, for each location, which one of the two sets is used for the game. The game is divided into a series of rounds. During each round, each player takes one turn as the active player, starting with the first player. All players simultaneously* receive divine blessings. Note: Remember, in a two-player game, perform this step twice. Receiving a Divine Blessing : Roll both your dice and place them back on your Inventory with the rolled faces facing up. Then apply the effects of the two rolled die faces in the order of your choice. (In most cases, this will consist of gaining resources). In case of a conflict between players when applying the effects of certain special die faces, follow the turn order, starting with the active player. Receiving a Minor Blessing: Choose one of your dice and roll it; place the die back on your inventory with the rolled face facing up and apply its effect. This does not occur during Step 1 , only via card effects. If he has one or more cards with reinforcement effects the active player may apply each effect once in the order of his choice. A) - Make an offering to the Gods. The active player takes one or more strictly different die faces from the Sanctuary, spending the required for each face acquired. The player must then immediately forge these new faces in the order of his choice. 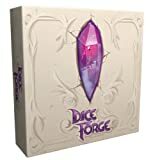 Forging a Die Face: Remove a die face that you want to replace, using the new die face as a lever. Then attach the new face to the empty side of the die and place the removed die face near your Inventory. B) - Perform a heroic feat. The active player chooses a heroic feat that he wants to perform and spends the resources indicated next to the Heroic Feat card. Then he moves* his pawn to the portal of the island containing the heroic feat. If necessary, he ousts the hero currently occupying the portal. If his pawn is already there, he doesn't need to move it. Note: A hero cannot perform a heroic feat if the corresponding card pile is empty. If the active player moves his Hero pawn to a portal that is already occupied by another player's Hero pawn, the other player moves his Hero pawn to his starting portal and immediately receives a divine blessing, as compensation. Then the active player takes the top Heroic Feat card from the stack and applies its effect, if any. Pile 1: Heroic Feats with no permanent effect. Pile 2: These permanent effects are activated throughout the game, subject to certain conditions. Note: This type of effect only appears on cards which are not used in the recommended setup rules for your introductory game. Pile 3: These permanent effects remain active throughout the game, and are activated during step 2 when the owner of the card is the active player. At the end of step 4 , the active player's turn ends immediately (whether or not he performed an extra action). A new turn begins. The next player in a clockwise order becomes the new active player. When all players have taken their turn as the active player, the round ends. If it is the end of the final round*, the game ends. Otherwise, advance the round tracker one space and begin a new round. Nine rounds in a two- or four-player game, and ten rounds in a three-player game. At the end of the final round, the game ends immediately and the scoring phase begins. 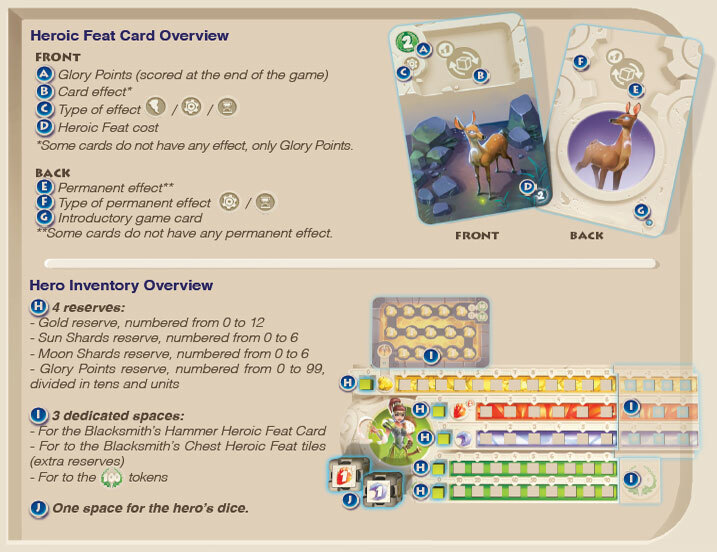 Each player adds all the from his Heroic Feat cards and his Hero Inventory together, including any tokens. The player with the most is the winner and earns a place among the gods. In case of a tie, all tied players win the game together. 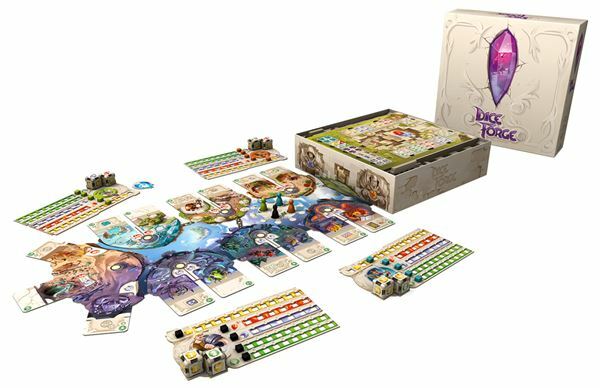 During the game, players can handle their dice to look at them as long as they return the dice to their Hero Inventory in their original position. 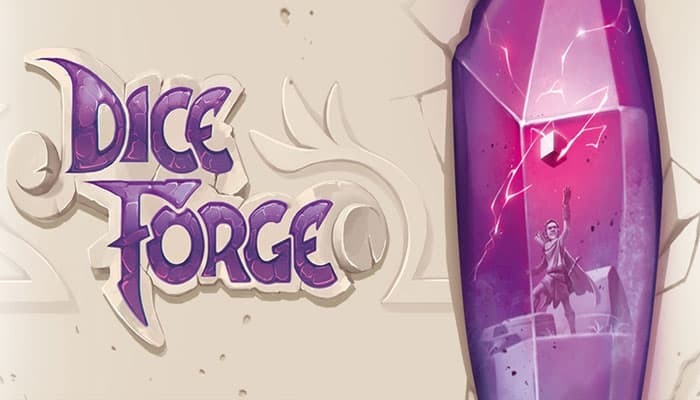 Forging a die face is the only way to modify a die. Players cannot rearrange the faces on their dice or put a previously-removed face back on a die. A Hero pawn remains in its location until it is either ousted or voluntarily moved to another portal. A player can perform any Heroic Feat, including those he already performed (including during the same turn). If you have reached the maximum on a particular reserve track ( , or ), any additional resources gained are lost. If you reach 100 , take a token, place your marker back on space "0" of the Glory Point track, and start counting from 0 again.